Contrary to popular belief, snoring is not a normal feature of sleep. It's actually indicative of trouble breathing during sleep associated with a restricted or blocked airway. In severe cases a person may have to wake as many as 40 times in night just to breathe. OSA has also been associated with depression and high blood pressure. It is not uncommon to move around a little while falling asleep. RLS however goes beyond normal shifts for comfort and in severe cases sufferers feel the need to be moving almost constantly. 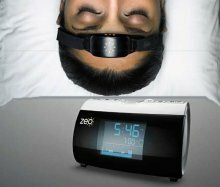 This need to be moving disrupts one's ability to sleep, leading to difficulties initiating and maintaining sleep. Creeping, crawling, tingling, burning, cramping, or itching feelings in the legs during periods of inactivity may be signs of RLS and should be brought up with your doctor as they only get worse with time. Insomnia has also been associated with mental disorders such as schizophrenia and Post-Traumatic Stress Syndrome. 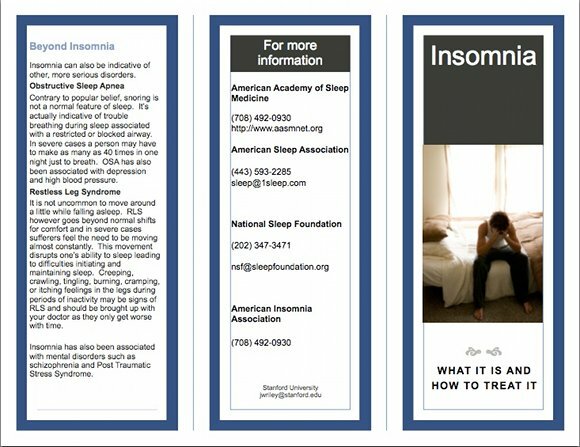 In short, insomnia is any sort of difficulty sleeping that affects almost one third of American adults in some way. In reality insomnia is not so much a disease as a symptom. It can have many causes and vary greatly in its severity. However, the diagnoses and treatments are relatively simple and easy to get. 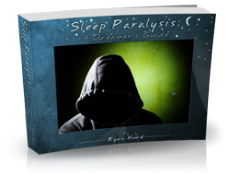 Obviously the main clue that a person has insomnia is if they have trouble either falling or staying asleep. If someone goes to bed and finds they lay there for a long time (greater than 31 minutes according to the International Classification of Sleep Disorders), or they wake up soon after falling asleep (also 31 minutes according to the ICSD) for more than 3 nights in a week it's generally considered insomnia. If the problem persists for more than 4 weeks it's considered chronic insomnia, less and it's called acute insomnia. Just taking a while to fall asleep doesn't make someone an insomniac though. Since there has been no conclusive evidence that long term sleep deprivation does permanent physical damage to people, the only time an insomnia diagnosis is relevant is when it effects a person's daily routine. If someone is experiencing feelings of drowsiness and/or difficulty staying awake during normal daytime activities as a result of their inability to fall or stay asleep it is evidence that the person is carrying a massive sleep debt and is, or soon will be, in danger of falling asleep unintentionally. The body's need to sleep can eventually become so strong that it is possible to fall asleep while operating a vehicle or machinery, which can often prove fatal. Other signs of insomnia can be impaired motor function i.e. poor coordination, excessive irritability and poor memory. As stated before, most insomnia stems from some disturbance in the normal routine. Often, simply removing the disturbance is enough to get a person back into normal sleep patterns. Taking some time off of work to lower stress or asking the neighbors to turn off the techno music when you go to bed can be all it takes to cure one's insomnia. Other non-pharmacological methods of curing insomnia include: exercising at some point during the day (ideally 4-5 hours before bed), avoiding caffeinated beverages in the later half of the day, using relaxation techniques such as meditation before bed, and reducing the amount of ambient noise and light in the sleeping area. Another method is to stay away from the bed until it is time to sleep. Avoid eating, reading, or working in the bedroom and bed and only get in when you are ready to sleep. If insomnia still persists it's time to go see a doctor, who will generally give a prescription for a high strength sleep medication. I've heard that prescription sleep meds can be dangerous. Does that mean I should avoid them? Most modern sleep meds carry little to no risk, especially if used for only a short period of time in emergency sleep situations. Additionally, sleeping pills are NOT addictive. 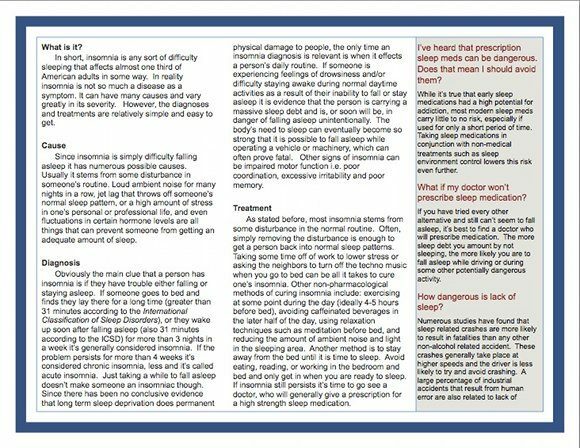 Taking sleep medications in conjunction with non-medical treatments such as sleep environment control lowers this risk even further. If you have tried every other alternative and still can't seem to fall asleep, it's best to find a doctor who will prescribe medication. The more sleep debt you amount by not sleeping, the more likely you are to fall asleep while driving or during some other potentially dangerous activity. How dangerous is lack of sleep? Numerous studies have found that sleep related crashes are more likely to result in fatalities than any other non-alcohol related accident. These crashes generally take place at higher speeds and the driver is less likely to try and avoid crashing. A large percentage of industrial accidents that result from human error are also related to lack of adequate sleep.